The IWCO Direct National Sales Meeting was held recently at our corporate headquarters in Minnesota. It was a great week with the best people in the industry. Our Sales and Marketing teams came together for company updates, education, and discussion on best practices within our industry. It is always time well spent and many conversations lead to memories about times long gone when direct marketing strategies were much less sophisticated. While we are proud of our roots in direct mail, we continue to find ways to innovate and expand direct marketing’s reach and success through omnichannel campaigns. We’ve discussed and defined omnichannel campaigns many times on SpeakingDIRECT. It boils down to sending the right message, at the right time, on the right channel, to the right person—creating the relationship that leads to new and more loyal customers. It can be hard to do, but well worth the investment. Moving toward an integrated omnichannel experience involves analyzing data from multiple channels and utilizing it in a meaningful—but not creepy—way, including bridging the gap between digital and paper-based communication. That means combining direct mail, email, and other digital channels to shape the customer journey. Just as direct mail is a cornerstone of IWCO Direct, we have found that it remains the cornerstone of almost all omnichannel campaigns—over and over again. Our own testing has shown that integrating direct mail with digital channels can increase conversion by 20–40%. 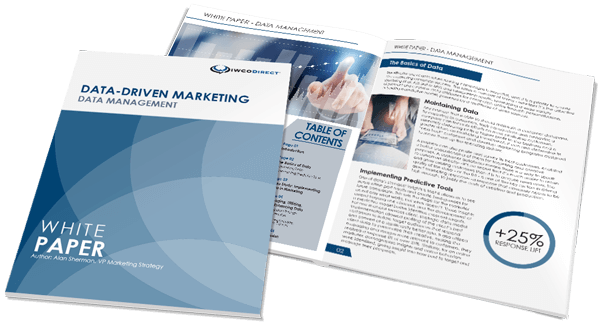 Research by ReachDynamics confirms our results, reporting that campaigns can achieve three times the ROI on direct mail spend when paired with digital marketing tactics. Alan Sherman previously shared some of the ways we have of triggering direct mail based on online behavior, including pixel retargeting, email listening, and social linkage. The continued evolution of campaign management tools and color digital printing is making authentic and integrated direct mail easier than ever. Data allows each direct mail piece to be unique based on demographics and customer behavior. Automation allows for decreased cycle time. And response rates confirm direct mail is still a trusted, effective channel. Done right, it can contribute to the personal experience that consumers are expecting. Want to know more about creating the right customer experience using direct mail to seal the deal for your next integrated omnichannel campaign? Contact me here. Senior Customer Engagement Manager with a degree in Visual Communication Technology from Bowling Green State University. Abides by the “improve, innovate, and always do the right thing” mantra at IWCO Direct since 2005. Works with some of the best people in the business to come up with new and exciting ways to expand clients’ business with world-class marketing. Movie buff, coffee drinker, volunteer, fan of whatever sports her kids are playing, and proud World’s Meanest Mom (awarded for making them wait until eighth grade to get their own smartphones).